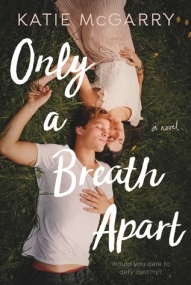 ONLY A BREATH APART alternates POV between Jesse and Scarlett. The two of them used to be best friends as children, but are torn apart and grow to be enemies. This is a story of love, loss, and friendship. Jesse has always had a connection to the land. But when his grandma dies, his uncle threatens to sell the land because Jesse isn't responsible enough to maintain it. Jesse will do anything to keep his land. Even if it means he has to rely on repairing his old friendship with Scarlett. Scarlett has an overprotective father who barely lets her do anything. She wants to go to a school that's too far for her dad's liking. When she's told that Jesse is the key to getting what she truly wants, she finds it hard to believe. As the two attempt to rebuild their friendship for their own personal reasons, they find their hearts connecting. Final Verdict: This is perfect for fans of romance with a twist. I love the depth Katie McGarry gives the two characters.